What happens to light when it is trapped in a box? 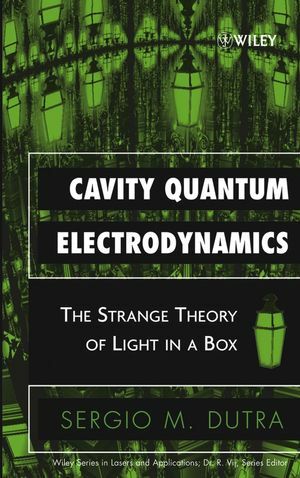 Despite being one of many specialties within physics, cavity quantum electrodynamics serves as a window to many of the fundamental issues of physics. Cavity Quantum Electrodynamics will serve as an excellent resource for advanced undergraduate quantum mechanics courses as well as for graduate students, researchers, and scientists who need a comprehensive introduction to the field. SERGIO M. DUTRA's passion for quantum optics dates back to 1989. He received a PhD from Imperial College, London, studying cavity quantum electrodynamics. Dr. Dutra is a Chartered Physicist and a member of the British Institute of Physics. He has worked at Campinas University in Brazil and Leiden University in the Netherlands, published a number of papers in peer-reviewed international journals, a chapter of a book, and spoken at conferences in several countries. 4. A Box of Photons. 8. The Maser, the Laser, and their Cavity-QED Cousins. Appendix A: Perfect Cavity Modes. Appendix B: Perfect Cavity Boundary Conditions. Appendix C: Quaternions and Special Relativity. Appendix D: The Baker-Hausdorff Formula. Appendix E: Vectors and Vector Identities. Appendix F: The Good, the Bad, and the Ugly.